The beer: James Squire Hop Thief #7. Where did it come from? : The mailman. I got a free six-pack sent to me at work for review. 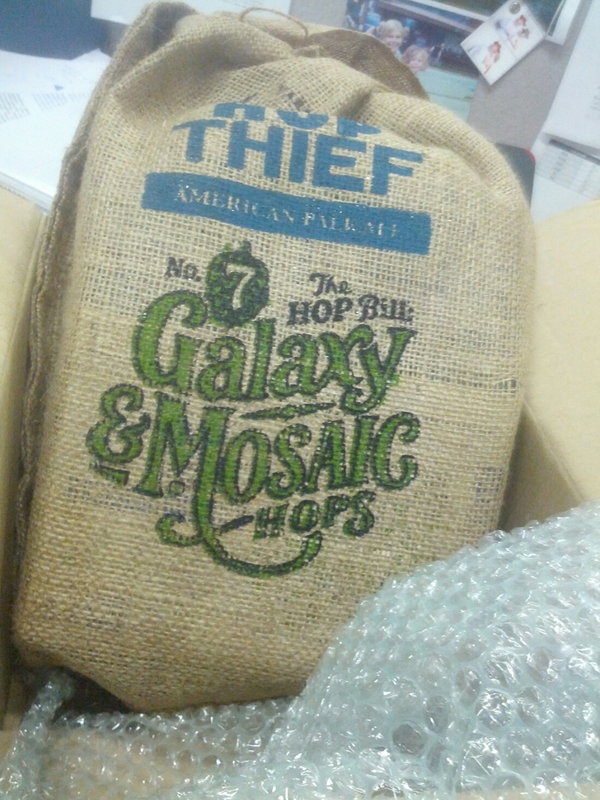 Now if there’s anything better than someone sending beer to you at work, I don’t know what it is. What’s it like? : There is supposed to be Galaxy and Mosaic hops in here. Now Galaxy has a very distinctive – and delicious – aroma but I couldn’t find much of it here at all. There’s a Ginger Snap biscuit flavour at the front (I initially called it ‘‘toffee’’) and then some citrus hop bizzo turns up in the mid-palate before it wraps up with some slight bitterness. Why do you like it? : Well, I like the Hop Thief concept of using different hops with every iteration. Sure, it’s not anything groundbreaking but still, it’s a biggish deal for a mainstreamer like James Squire to be trying something like this. And to stick at it for seven different versions. Also, it does go down easy – even if there isn’t as much hop character as I expected. Okay, now you can tell the story you think is funny/interesting? : They call this an American Pale Ale, but I don’t know about that. Unless it’s meant to be an entry-level US pale, on a par with the rest of the range. Because, really, there’s nowhere near enough hop character for it to be an American pale. Yeah, sure, it’s a good beer and I will certainly drink the entire six-pack myself. But I’m thinking it’s not really an American pale. Who would want to be a beer snob? From that description, it sounds like you might have had an old beer. The hops tend to degrade if the beer sits on the shelves too long.